Brazil's second generation of communications satellites are the result of joint engineering and manufacturing efforts in the United States and Brazil. The new spacecraft are called the Brasilsat B series, and are widebody, more powerful versions of Hughes Space and Communications Company's popular HS-376 model. 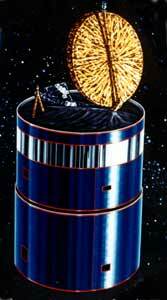 EMBRATEL, Brazil's telecommunications company, signed a contract in August 1990 for two spacecraft. In December 1995, with those new satellites in orbit and rapidly filling with customers, EMBRATEL exercised an option for a third spacecraft. A fourth was ordered in June 1998. As part of the contract, Hughes split the ground station engineering work with Promon Engenharia SA of São Paulo. The Brazilian Institute of Space Research (INPE), in São José dos Campos, was designated the site for final system testing of Brasilsat B1 and B2. Brasilsat B3 and B4 were tested at Hughes. Brasilsat B1 was successfully launched Aug. 10, 1994, on an Ariane-44LP H10+ rocket from neighboring French Guiana. Brasilsat B2 was launched 28 March 1995, also on an Ariane-44LP H10+. Brasilsat B3 was launched on an Ariane-44LP H10-3 on Feb. 4, 1998. Brasilsat B4 was launched on an Ariane-44LP H10-3 on Aug. 17, 2000. A pair of 376 model satellites started providing service to Brazil in 1985, operated by EMBRATEL. Like the first-generation satellites, the Brasilsat B spacecraft provide basic telecommunications services: telephone, television, facsimile and data transmission, and business networks. Compared to their predecessors, the new Hughes HS-376W satellites are not only larger and more powerful, they also have greater capacity and employ the latest technologies. The extra power provides better performance without an increase in user costs. Like the highly reliable HS-376 model, the HS-376W spacecraft are spin-stabilized satellites, each with two cylindrical, telescoping solar panels. The bottom panel slides over the upper portion for launch and the antenna folds down, making the 376W spacecraft 3.43 meters (11 feet, 3 inches) high. Deployed in orbit, each spacecraft expands to 8.3 meters (27 feet, 3 inches) high. They are 3.65 meters (12 feet) in diameter, and weigh 1052 kg (2320 lb) at the start of life in orbit. The solar panels, covered with large-area silicon solar cells, provide up to 1800 Watts. A Hughes-designed 18-cell nickel-hydrogen battery provides power during eclipses. Each spacecraft has 28 active C-band transponders powered by twenty-four 13 watt and four 15.5 watt Hughes-developed solid-state power amplifiers (SSPAs). The effective isotropic radiated power (EIRP) varies from 33 to 41 dBW, depending on the area covered. Both the B1 and B2 satellites have one X-band transponder for military use, powered by a 40 watt traveling-wave tube amplifier. Its EIRP is 33 dBW. B3 and B4 do not have X-band, and instead offer 20 percent greater signal power in C-band. To provide this extra power, B3 and B4 use 24 SSPAs with 15.3 Watts and four with 16.5 Watts. The contract calls for a 12-year operational life for B1 and B2, and 12.6 years for B3 and B4. The dual-polarized C-band antenna is 2.44 meters (8 feet) in diameter and delivers nationwide communications coverage. In addition, there is a regional beam for the populous east coast, with a high-gain area for business networking in four cities (Belo Horizonte, Curitiba, Rio de Janeiro, and São Paulo). The direct-radiating X-band antenna on B1 and B2 is much smaller, about a quarter-meter (10 inches) in diameter, but its coverage area is South America and the south Atlantic. The first satellite is positioned at 70 degrees West longitude, the second at 65 degrees West, the third at 84 West, and the fourth at 92 West. The contract also calls for upgrades to the satellite tracking, telemetry, and control station in Guaratiba, outside Rio de Janeiro. This work includes automated equipment to monitor the satellites and a backup control station at Tangua.